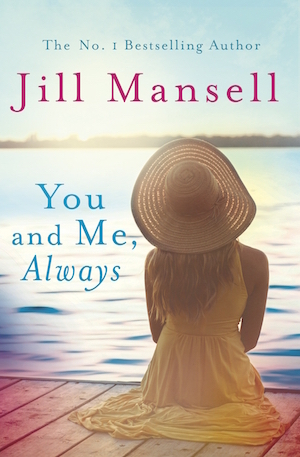 You and Me, Always by Jill Mansell is only the second novel I have read by her. I know for sure it won't be my last. How does she do it, make you chuckle out loud one moment and swallow with emotion the next. I don't know, but she has talent and does! Do you ever come out of the movie theatre, a little teary eyed but satisfied that you've seen a good movie and sort of blink at the daylight. That's how I was as I finally put down this book after finishing it. What a delightfully quaint village and quirky characters who fill this book. A place where people unabashedly listen in to others conversations and even occasionally offer their opinions. So who are these characters who just slip into your heart? Well obviously there is Lily - a down to earth, honest, charming and hard working woman. She lost her mother at eight and has been brought up by Coral and Nick, good friends of her mother. She is the the centre and all the others circle around her. Patsy, ten years older and earlier on Lily's babysitter. Now they are good friends. Patsy has not been lucky in love and seems to have an ongoing situation of hapless meetings with potential internet dates. Then Tom, her brother. All time - long time friend of Lily. In the early times he showed his liking for her by teasing, as boys do. But guess what there are deeper feelings there. But wait, arriving on the scene is Eddie, a movie star who just happens to get caught up with Lily in a surprising meeting. He is rather nice and well... Lily and he might just turn into an item. In the last letter to Lily her mother gives her a gift that was given to her by a man she loved but lost. This leads Lily into searching him out, and then that leads Declan to becoming involved in her life and the village. Then surprise, surprise - the father Lily has never known arrives on the scene. And the plot thickens! Characters you will fall in love with, a village you'll want to visit, definitely an entertaining and heartwarming read. Great review!! I've read one of her other books and enjoyed it, so I'm definitely adding this one to my TBR. And that cover!! It just makes me want to be by the water!! I know, this cover is gorgeous! I've read a few other books by this author, and have enjoyed each one. Her books are a bit harder to find in the states, so I usually have to order them or get them from NetGalley. The first one I read was from NetGalley, and it was Elizabeth from the Evil Overlord who lead me to read Jill Mansell. Funny because Elizabeth hales from the north east coast of the USA! I just may try her out. Glad you had a pleasant read. It was a pleasure to read Stefanie. Yes, not doubt I'll try a few more of hers. She's a new to me author too but this sounds wonderful! She is a British writer Debbie and I was introduced to her by an American reader! Your review makes me want to read this one...and I've never read this author. I think I'm missing out. Thanks for sharing. Try her some time Laurel-Rain. Would be a light read for you but hopefully pleasurable. Mansill always seems to write real characters. This one sounds like it has a bit of mystery. I'm glad you enjoyed it. I will keep it in mind for future reading.